Next Tuesday voters of Freetown and the North End of Fall River will go to the polls to choose a new State Representative. The vacancy results from the resignation several months ago of State Representative David Sullivan. The candidates are David Steinhof, a third-generation Fall River dentist, and Carole Fiola, whose husband Ken Fiola is vice-president of Fall River’s Economic Development Office. 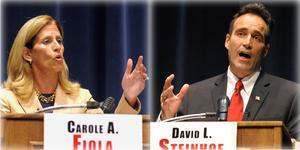 At a debate a few nights ago, as reported in the Herald News, Fiola said that she supports the State’s new gas and cigarette tax but not the software services tax; Steinhof favors n o new taxes. Fiola said that she supported the two taxes — but not the software tax — because Fall river needs new funds to improve transportation to and from the city’ Steinhof says that Fall River doesn’t need new funds because it’s already got a great, deep water port, as he put it. Polls open at 7 A.M. next Tuesday. To all our readers at The Local Vocal….